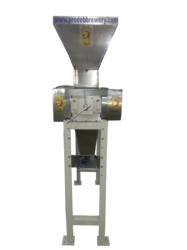 Pioneers in the industry, we offer malt mill from India. The machine is a pair of roller grinder whose product is rough broken malt. Its main gadget is its two cylindrical drums with the same diameter. The two drums rotate in opposite directions for generating extruding force and shearing force to smash malt. There are waves/grooves on the drum surface. The malt is broken between the two rotating drums the gap between the drums can be adjusted according to the requirement of the size of the broken malt desired for the brewing purpose.